Realism in dolls house food is achieved through attention to shape, color, and texture. These miniature slices of bread and toast are the correct thinness and texture for all kinds of food combinations and sandwiches. You can also decorate the slices for scenes on their own as shown. Here the slices are plain white bread, toasted bread, bread with honey, bread with chocolate sprinkles, bread with jam, and a slice of unfinished bread ready to turn into a sandwich or another style of toast. All the basic slices are made by rolling out a thin roll of polymer clay, texturing the clay, then cutting out the slice shapes with a miniature cookie cutter. This makes slices that will match closely for realistic sandwiches. To make bread slices in dolls house scales you will need texturing tools and a cookie cutter to cut out the bread slices. Take a conditioned waste piece of polymer clay and press it down on a clean flat surface while pinching the back, in order to make a flat surface with a small handle on the back. Press the flat surface onto a piece of pumice, or a piece of fine natural sea sponge, or into the most open side of a section of dry florist foam, to create a texturing tool with fine open lines. If you wish to mark some holes for your breads, add very fine no hole beads to your texturing tool. You can also experiment with bits of sand or other fine grit, baked onto the surface of the tool. When you have created a texture you think will give you some useful texture for bread, bake your tool according to the directions for your polymer clay. When finished the tool can be used to texture small pieces of clay to make bread or cakes, or it can be stamped over a larger rolled out section of clay before you cut individual slices from it. Remember that on your texturing tool, any raised sections will become depressions in the actual slice of miniature bread. Follow the basic instruction for making cookie cutters from foil strips with handles of polymer clay. Heavy foil from a baking pan is ideal, but you may also find suitable foil in a scrapbook supply store. You want to make a cookie cutter the correct dimensions and shape for a slice of bread in your particular scale. In general, slices of bread will have rounded edges, which overlap the sides slightly on the top. The top usually also has a small dent towards the center. You can easily make a range of different shaped cutters for different styles of bread slice if you wish. Mix a Suitable Color of Polymer Clay - Choose a suitable mixture of clay colors for the type of bread you want to make and mix them into a bread dough color. For white bread you can use a version of the basic dough mix in polymer clay, with more white and less red and ochre clay. If you want to make whole wheat style breads, add very finely chopped or grated bits of baked polymer clay, as well as very fine sand to the dough mix to create the effect of pieces of grain in the bread slice. Roll The Clay Out On A Baking Tile or Surface - Roll the clay out to the correct thickness for the slice of bread you want to make. Most slices of bread are 1/2 inch or less thick, which is 1:12 scale means you need clay which is 1/24 inch thick. You can use playing cards on either side of your clay roller to set an appropriate thickness of clay. Texture the Clay Surface - Use your texturing tools to stamp a texture into the clay surface. You can further texture the clay after you have cut individual slices if you wish. Cut Out Your Bread Slices - Dip your custom cookie cutter in talcum powder or cornstarch and shake off the excess. Use the cutter to cut individual bread slices from your rolled and textured dough. Leave the slices attached to the tile but gently peel away the excess clay for future use. Finish Texturing Your Slices - Use a stiff paintbrush if you wish to gently texture the surface of your bread slice further. If you wish you can use a pin to make some elongated holes completely through your bread slice as they appear in some types of bread. At this point, you can either bake your bread slices or prepare your bread toppings from polymer clay and bake them at the same time. Make Toppings For Sliced Breads - If you wish you can bake topping made from polymer clay at the same time as you bake your bread slices. Make Jam - In the photo above you can see liquid fimo clay mixed incompletely with red polymer clay to make a blobby mix of partially melted strawberry jam. For individual slices of toast, make the jam section a separate layer using the slice cutter as a guide for the size of the jam portion. Make Honey - Honey is made the same way as a jam by combining a small amount of ochre or caramel colored clay with liquid Fimo Clay. Use the tip of a pin to spread the honey out in a zig-zag pattern that will fit on a single slice of bread. Bake your slices and toppings according to the directions for your polymer clay. To make dolls house scale sprinkles for toppings for dolls house baking, roll out very fine rolls of polymer clay in your choice of colors. The clay must be stretched and rolled to the finest possible thread of polymer clay. The 'chocolate' sprinkle rolls above are the smallest that could be made with this particular clay. You can see how large they are in comparison to the slice of 1:12 scale dolls house bread in the top of the photo. Bake the clay according to the instructions for your particular brand. When the clay has baked, take a very sharp clay blade or craft knife, and cut the fine strands of clay into the tiniest pieces you can manage. Collect the pieces carefully in a small container to keep for later use. If you use brightly colored orange, pink, blue and yellow clays, you can make scale 'hundreds and thousands' or colored sprinkles for doughnuts, cookies, cakes and fairy bread. Making the sprinkles from chocolate colored clay makes chocolate sprinkles for rum balls, bread with chocolate sprinkles (a special treat for Dutch children) or decorations for cookies or cakes in miniature. Mix ochre colored acrylic paint with a small amount of brown and red or orange paint. When you have a color suitable for the crusts of your particular type of bread, apply it to the tip of a small paintbrush, and brush it gently over the sides only, of your bread slices. If some paint strays onto the surface of your bread wipe it off with a small section of make up sponge, or a piece of tissue paper. 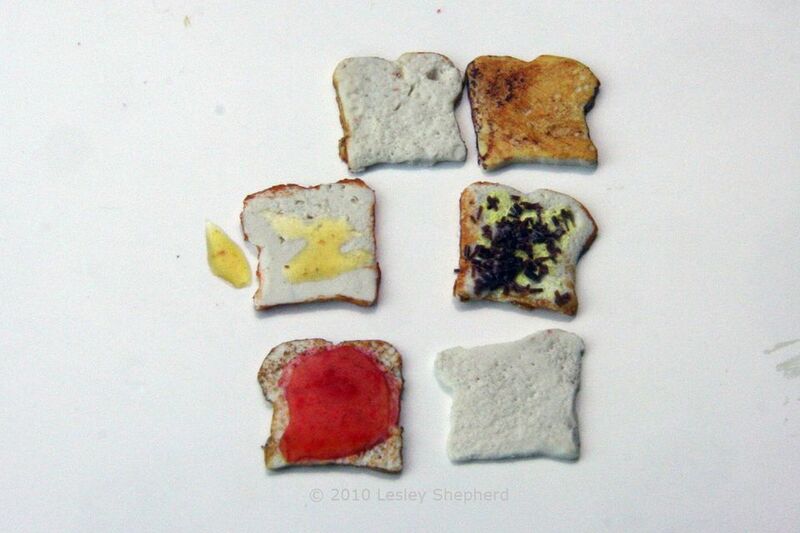 Set your bread slices aside for the paint to dry. Brush an ochre colored pastel or chalk gently over the surface of your finished bread slice, allowing the color to build up on the raised surfaces. Add a second layer of darker brown chalk in some areas to make it look more strongly toasted. Glue the zig zags of clear polymer clay you made in the previous step to the surface of a slice of toasted or untoasted bread. You can add this as a second layer to your finished bread and re bake it to set the honey (or jam) layer made from liquid fimo. If you wish the effect of butter, you can brush on a pale yellow acrylic paint (thicker tube acrylic will look like thick, cold butter) onto the bread, then set the honey layer over that once it has dried. Apply a layer of acrylic paint to represent butter or margarine (thin, darker colored paint brushed into the texture of the slice will resemble melted margarine or butter) Add your section of jam (pre baked) to the top of your buttered bread slice. If you prefer you can omit the buttered layer and apply liquid Fimo directly to your bread slices when you first bake them. Glue your jam layer in place (pva glue works fine). Arrange a fine layer of baked polymer clay sprinkles on a smooth surface (a baking tile works fine). Apply a thin layer of pva glue to your chosen bread slice, and using tweezers, turn it upside down and press it down into the sprinkle layer. Gently lift the slice of bread with the sprinkles now attached, and turn it right side over. Set it aside for the glue to dry. Toppings which resemble peanut butter, or have the texture of icing, can be easily made by coloring tube acrylic paint the correct color and adding it to the bread slice with a toothpick or texturing tool to make it look like it has been spread by a knife. Set the slice with its acrylic paint 'spread' aside to dry. This technique works well for soft cheese, butter, peanut butter, hazelnut chocolate spread, marshmallow paste, and any other type of spread commonly used on bread.